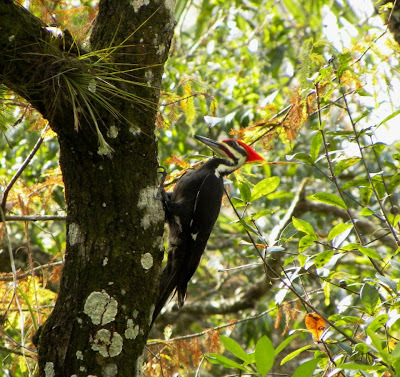 Up until last year, I don't remember ever seeing a Pileated Woodpecker. He was on my list of "must finds" for a long time until we finally saw one last year here in Fort Myers. The other day I saw one at Estero Bay. 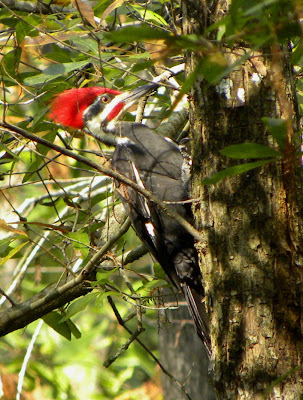 Yesterday, we walked the boardwalk at Six Mile Cypress Slough Preserve and saw five Pileated Woodpeckers! I took so many pictures, I was sure I would run out of film. 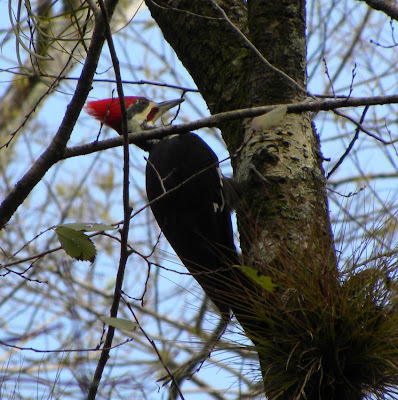 They are gorgeous, big (almost 2 feet tall) birds with a bright red top-notch or crest - just like Woody Woodpecker. The males have a red mustache. I like this picture with the air plant and lichen on the tree and the fall colors in the background. It was difficult getting a good picture because his head was always moving - drumming on the tree. He was probably looking for insects, but they also drum to announce their territory - and with so many others in the area - he needed to do a lot of announcing. 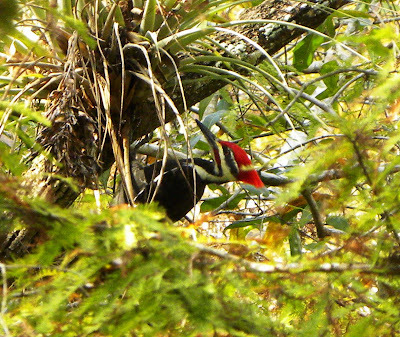 The red crest and moustache are clearest in this picture. 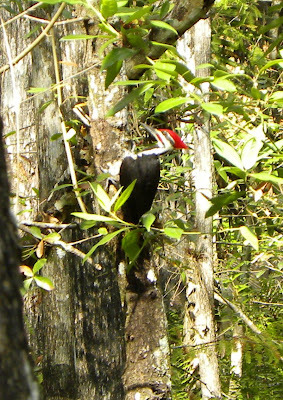 His bright red crest was easy to spot looking through the trees. I promise this is the last picture of a woodpecker. We saw other cool things too! 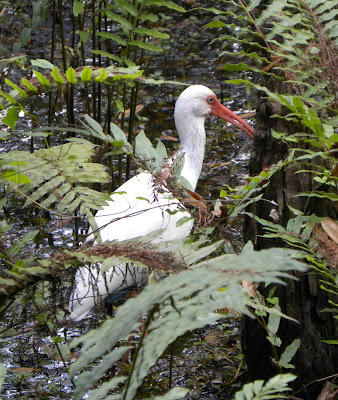 There were not too many wading birds - just a few Ibis. 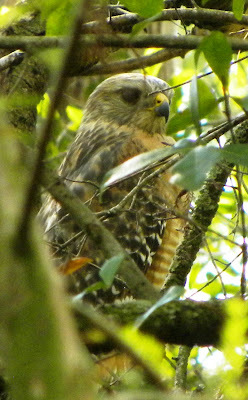 Look at this Red-shouldered Hawk! 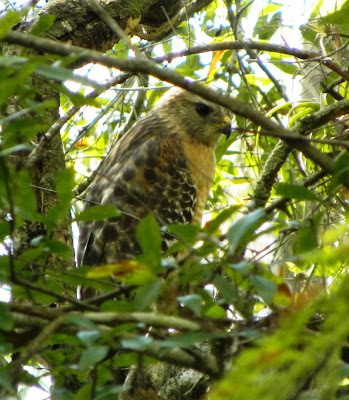 He was sitting high in a tree and we could barely see him without binoculars (but we heard him!). I had to zoom all the way in to get this shot - and then crop it way down. I usually have difficulty with the focus when there are tree limbs in the way - but this one was a pleasant surprise. 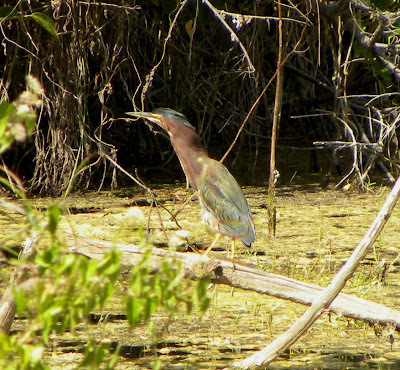 A Green Heron hunting for small fish or frogs - maybe a tasty insect or two. According to my book, they "fish" by placing insects on top of the water to attract fish to catch. Pretty smart! 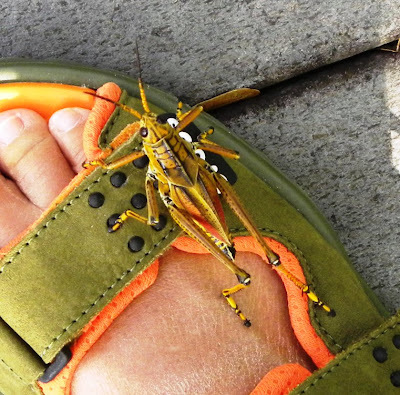 This friendly Southeastern Lubber Grasshopper wanted to join us on our walk. Look at how amazing he is! His colors were beautiful. 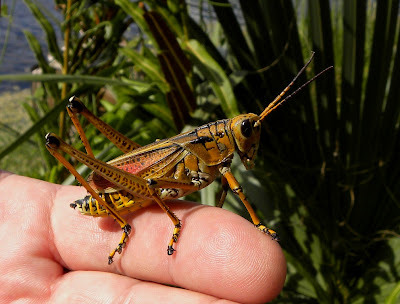 I've read that they can produce a bad-smelling odor to deter predators, but this little guy was very friendly and nicely posed on Bill's hand so I could get his picture. 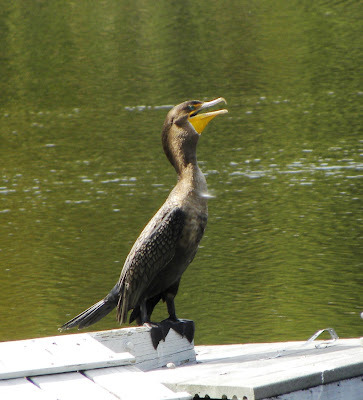 There were a couple of Double-crested Cormorants sitting on a float out in the lake. He appears to be singing - doesn't he? 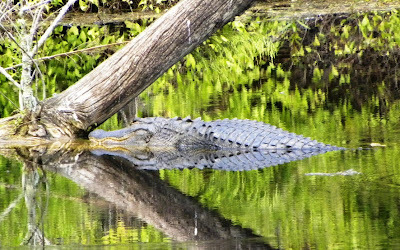 And our resident alligator was resting by a fallen tree on the far side of the lake. You have to look closely as the reflection in the water is a perfect mirror of what is above water. This alligator is named "Grampa" and is about 14 feet long. It's just a bit cooler here today - which is a nice break from the record-breaking heat we have been having. Bill is off to the R/Sea Hawks Flying Field and I'm sitting on the lanai enjoying the ducks swimming on the lake. Our friends, Dorothy and Mary Jane arrive today from the cold north and it will be good to see them. More Birds, Ducks and a Muskrat!